Disclosure: A product coupon was sent to help facilitate this post. All opinions stated are genuine and my own. Don't Mask Odors, Eliminate them! You've likely used Febreze at some point in time for one thing or another in your home. I remember the first time I tried and was majorly impressed with the original spray. That was years ago. Now the product line has expanded quite a bit and there are many items available to try and use, including the new Frebreze In-Wash Odor Eliminator. Parents want to be prepared for the new school year with school supplies, new clothes and healthy lunch ideas. Unfortunately, kids can lose their pens and pencils, lunch becomes a guessing game of whether they ate and new clothes do not last. With gym class, recess, after school sports and the chance of spilt milk, clothes get smelly as well as dirty. 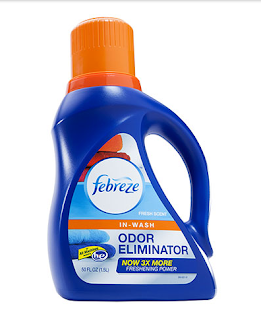 To help with mysterious odors clinging to kids clothes, Febreze created Febreze In-Wash Odor Eliminator. The formula works along with detergent and targets lingering odors while detergent focuses on cleaning away dirt and stains. Febreze In-Wash Odor Eliminator is so strong that it gets rid of lasting smoke, sweat, mildew and pet odors. Now that's something to write home about. Start the new school year with confidence. With Febreze and their new In-Wash Odor Eliminator, it's okay for the kids to #BringTheStink! Are you a fan of Febreze? Will you be trying this new product? Be sure to visit the website where you can find more information on the product, and be sure to click here for your $2 off coupon! Wow, I had no idea febreze made an in-wash product! I love to use Febreze around the house so I would definitely give this a try! Especially after a campfire - when we go camping it seems to take 2 washes to get the campfire smoke smell out of clothes. Thanks for the coupon! Hi Rosey, I'm just popping in to say hi to you and I hope all is well with you. Getting rid of the stink sure works for our rink. With two stinky little boys and one stinky husband, this looks like a great product for me to use. I don't know how in the world they get so smelly, but they do! I love Febreze. I still use it (the original spray that is). I'm going to try this too. What a great idea for fresh smelling clothes. You know like kids' sport uniforms. I never knew they had something like this! I need this for some of the smelly clothes we have from people that smoked while we were around them. I will be checking this out! I will definitely will be trying Febreze. Between my husband and son our laundry can get pretty stinky! I can't tell you how much I need this. Sometimes someone will start a load of laundry and forget about it til the evening and it sits in the machine all day and gets that mildew smell. I wonder if this would help that, but it would probably just be wise to wash it all over again. Yes Rosey, I am a fan and can't wait to try this product. Thanks for the introduction. I have a feeling we will be using it quite a bit with soccer season starting soon. This sounds like a great product. As a mom of boys, this is definitely a product we can use! Oh awesome! We love febreeze stuff. We'll definitely have to check this out next time we're shopping. I honestly need this! My workout clothes are starting to smell pretty gross, even though I wash them after each use. I don't even want to wear them to workout in because they smell so bad! I love Febreeze products but didn't know that they made one for the laundry. Awesome! Thanks!! I have used Febreze and do like it very much. I have not tried this for the laundry, but will look into it! I like Febreeze products and will be curious to try the new in-wash odor elimnator. My husband can destroy a t-shirt in just an hour at work so by the end of the day, I need something like this for his laundry! This can really keep your clothes fresh and away from bad scents. This is great to use for washing. We will for sure have to give this a try. Sounds like a great way to get rid of the summer sweating smells! Thanks for the review.